Camp Bimini employs youth and those young at heart in many part-time and full-time positions for our summer camp program. We are now accepting applications for several positions. Please visit our Join Our Team page full details and to download an application form. The staff at Camp Bimini take the lead from the program staff, supporting the Camp philosophy and contributing to the good feelings and atmosphere. Supervisory people include professional educators, university graduates and senior college students, most of whom have been at Bimini for several seasons. Counselors and C.I.T.s are university or high school students with good camping backgrounds and a genuine interest in children. Activity instructors are qualified professionals or skilled students who are all aware of the special responsibilities in dealing with younger children. Camp Bimini staff are spirited and supportive. 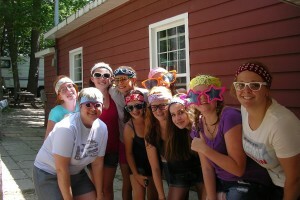 Together they form a dynamic team and make our camp a special place for kids.